Mr. Ross, the New Yorker critic, goes everywhere, knows everything, has insights, compassion and understanding. Mr. Denk, a practicing musician, has not only the insider’s look at his art, but basks in a wide range of interests outside the piano. 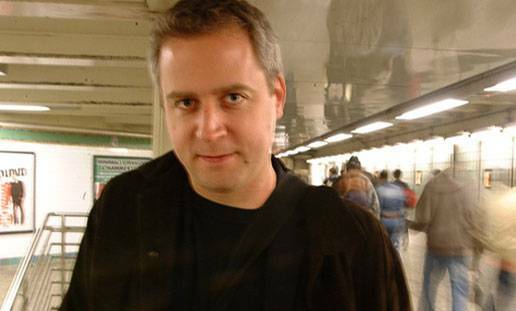 Plus, Jeremy Denk has a wicked sense of political and social satire which he frequently puts to eviscerating use. I say “practicing” musician, but Jeremy Denk’s recitals float so easily above the piano that one can’t imagine him doing scales and exercises His fingers delight as much in the impossible intricacies of a Ligeti etude, as they swirl around a Bach toccata. His power for a Beethoven sonata is daunting–not for its physical command as its emotional grasp. And his trademark sonatas of Charles Ives offer a more dramatic view of the composer than any older pianist. What I hadn’t realized until last night was that Jeremy Denk is the born story-teller. Not a passage, not a measure goes by without his instinctive narrative skills briefing us on emotional tirades, haloed goodness, conflicts and myths. I’m not referring to a Straussian literal imitation: Mr. Denk is a pure musician with no onomatopoeic sounds to convey But music is virtually a metaphor in his hands, used to project fthe real emotional feelings of the composers. This has its negative side. So outwardly theatrical were the first three works on the program, so energetic and rambunctious his performances, then the final work, Beethoven’s vast–inwardly vast–C Minor Sonata–was played as if a marvelous actor of excellent theatre should take on King Lear. He did a magnificent job, but it seemed like one more magic trick by a pianistic magician. This is patently unfair. Mr. Denk had already played Ligeti and Bach and an earlier Beethoven, so there was nothing lightweight about his prowess. But the Beethoven has a blatant profundity which the other works don’t even attempt. And Mr. Denk did play this Sonata with a clarity, reverence and understanding which few pianists possess. Reverential not in pausing for effects or taking special care. He didn’t have to make room for that fugue: it organically rose from the movement, beginning like the first leaks Lava before the Mount Etna eruption. That brilliant series of trills toward the end were executed so cleanly that one didn’t even realize they were trills And it was this respect for the notes themselves that emphasized that moment when Beethoven combined the opening theme of the movement with the series of trills. What we would call yin and yang together for a cosmic unity. Frankly, after this, I thought an encore would be an imposition, but Mr. Denk played almost his trademark work, a movement (the sentimental “Alcotts”) from Ives’ Concord Sonata. Johann Sebastian Bach would never have recognized Mr. Denk’s performance of the D Major Toccata, simply because he could never imagine an instrument like a Steinway. Mr. Denk never attempted a “Baroque” sound, but used the Steinway to the nth degree. Every single phrase, sometimes every note, had its own personality, and his piano responded with alacrity to the playing. Though his fingers (and often his body movements), Bach’s work argued, fretted, made love, opposed itself, made temporary war, disagreements and finally settled down to a truce. Let’s face it, the Toccata is not the B Minor Mass, and methinks Old Johann would have enjoyed the conversation. The rarely played F Sharp Minor Toccata is so difficult that the “story” is repressed for that crazy staccato fugue, a strange jig and, under Mr. Denk’s hands, a tranquil “amen” ending. The Ligeti Etudes are technically more challenging than any work of the past century, yet they are more endearing with each performance. For Mr. Denk, those challenges were child’s play, so he had time to emphasis the rhythms, the changes, the Latin “Fanfares” and the jazzy Bill Evans riffs of the following “Rainbows”. Mr. Denk did have his fun. His control was perfect, his varied tones and rhythms fit the work. At the end a man sitting next to me intoned “Beautiful, beautiful, beautiful.” It certainly was, But it was also the picture of two giants having fun. Beethoven, obviously, and the Titanic all-encompassing skills of Mr. Denk.